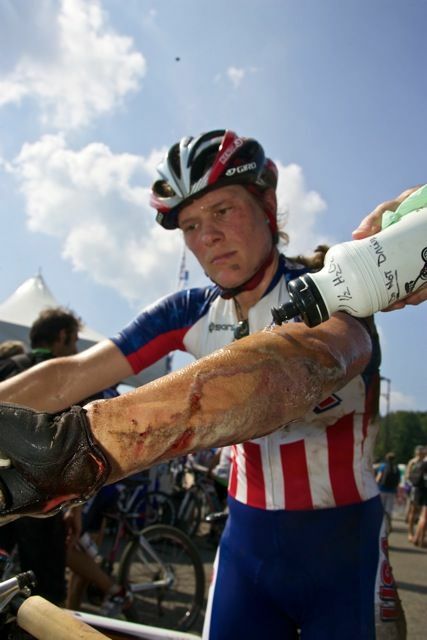 Katie Compton’s injuries sustained while riding the Mountain Bike World Championships course in Mont Sainte Anne, Quebec will force the six-time National Champion to miss the chance to defend her title at both CrossVegas and the Planet Bike Cup. 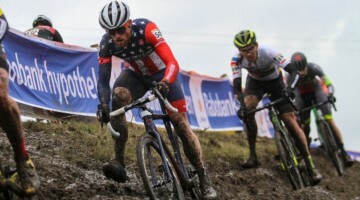 While training on the Worlds course, the Planet Bike rider took a hard fall on a rocky, technical singletrack, lacerating her elbow and knee, partially rupturing her knee’s bursa sac and bruising her bone. 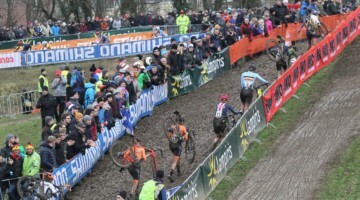 Her wounds needed stitches, and even after a few weeks of rest, she’s unable to swing a leg onto her cyclocross bike. 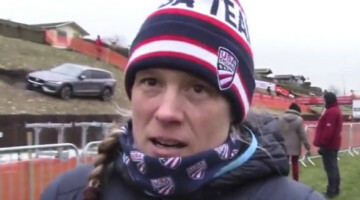 “Katie’s suffering from a lot of pain and can’t ride,” husband Mark Legg-Compton told Cyclocross Magazine. 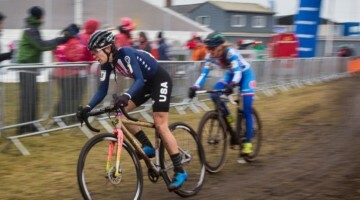 Although Compton was getting ready to show off her new National Champion jersey (see below) through a win, fans will still likely see the racer at these venues. Perhaps a delayed start for her season will give Compton some welcomed rest to peak later in the year and suppress her infamous leg cramps. We’ve seen stellar late seasons by Tim Johnson and Niels Albert after early season injuries. Her fans can only hope this will be the case as she prepares to make another run at the rainbow stripes this winter in Germany.